Bring me relics of your battles with the Slave Lords. Then, by order of Dame Gold, I shall forge mighty items for you! All base items are Bound to AccountBound to Account: This item is Bound to Account on Acquire, requiring access to the pack to craft these items. Located within the the Forsaken Temple (the part 1 quest location), right inside the quest entrance, safely before any challenging encounters. Note: Since there actually are both Heroic and Epic tiers for these upgrades, depending on which version of the instance you are in, you get different version of the barter UI and recipe listing. Everything is listed on this one page here for convenience. There is an item that drops in each dungeon (in small chests and the end chest). Each item can be equipped in two possible equipment slots (so 7 slots in all, as you can equip 2 rings). Chains / Legendary Waist/Neck ♦8Normal ●28Epic BtA Small chests, end chests. 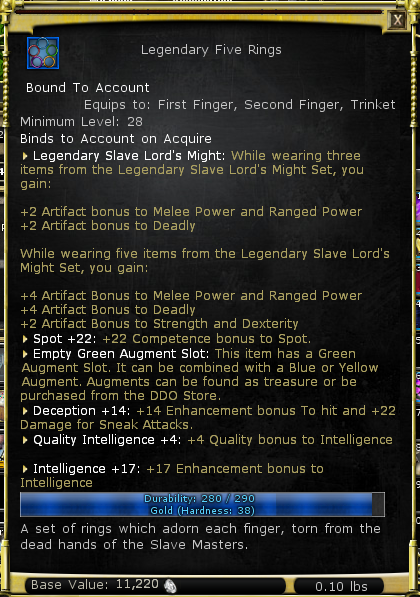 Common drop (20-30%) on LE. All items remain BtA after crafting effects applied. On Reaper difficulty, base items can drop with Reaper bonus. There are eight different ingredients that drop in the small chests and end chest throughout the quests. Once applied, these Gems can not be removed or overwritten. See below Recipes section for details. Named items dropping throughout the quest chain also can be considered part of this crafting. However, these are not much "customizable", rather are simple upgrade paths adding Set Bonuses. See Update 32 named items for the full list. Note: In the Heroic version of the barter window, the values displayed are incorrect for Quality Attributes, Quality Fortification, and Quality False Life. These are the correct values. 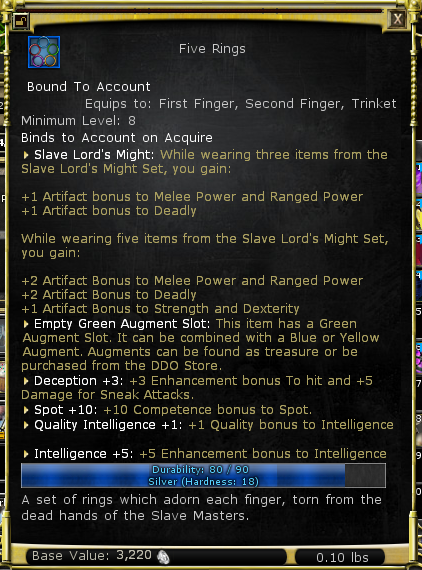 Remember, all Augment slots allow you to insert Colorless augments as well. The Mythic upgrades can be applied on named items and then can have 2 mythic bonus, 1 by drop and 1 applied (confirmed on a spinneret on live). Note: That you do not get a benefit from both (Ring of Power U35). That bonus can be overidden with a new one too. This page was last modified 12:54, April 16, 2019 (Update 40.2) by Clemeit. Based on work by others.